Home / North Palm Beach Edition / Are There Any New Technologies For Fat Reduction? Are There Any New Technologies For Fat Reduction? It is interesting to watch technology as it continues to evolve. Many of my patients are up to date with what is trending in aesthetic technology. There is a new exciting technology that melts and tightens skin simultaneous without downtime. reduction treatment for many of my patients. It is a way to non-invasively destroy fat cells by freezing fat, however it takes about 1 hour per area and depending on the patient, it could take up to 4 to 6 hours in one day! Also, the cost of CoolSculpting® is pretty much equivalent to liposuction. A newer technology has just been FDA approved for the same application of destroying fat cells non-invasively, but it uses heat. It’s called SculpSure™ by Cynosure®. Sculpsure™ is a laser device that uses a 1060 nm wavelength to target fat cells and destroy them without any incisions. SculpSure™ is a breakthrough non-invasive body contouring treatment for fat that has been unresponsive to diet and exercise. 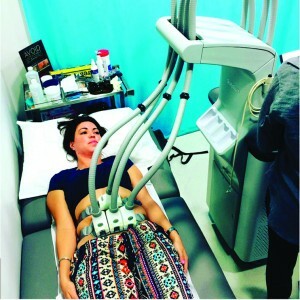 The treatments applicators are placed on the skin and a balance of laser wavelength with cold is projected to the fat layer, making it hot enough to achieve the right temperatures to destroy fat cells, but cold enough to be comfortable. The destroyed cells are disposed of by the body’s lymphatic system. The results are seen in 6-8 weeks and most people require just 1 treatment. Another major advantage and game changer is the skin tightening effects of this laser. So in summary, SculpSure™ is less expensive, takes less time and tightens skin very effectively. I’m very excited and happy to share this information! Next How Can Dental Implants Help My Denture?